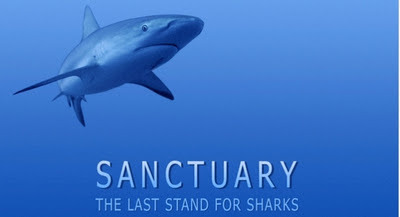 Our partners at the Pew Environment Group and Coral Reef Alliance are hosting a one-time showing of the new film Santuary, The Last Stand for Sharks next Monday, January 30, 2012 at 6:30 PM in San Francisco at the Embarcadero Center Cinema. As a supporter and reader of Shark Defenders, you are invited to attend. The film was shown late last year at DEMA, where it was named Best Shark Conservation Movie by the notorious Fiji Shark Blog. The invitation and more information is pasted below. Please register if you would like to attend (registration is free and helps the organizers know how many people are going to show up). This film portrays the underwater world of sharks and paints a global picture of the threats they are facing worldwide. Globally shark populations are declining, but there is growing momentum to protect sharks. Many locations are recognizing that sharks are worth more alive than dead, contributing both to the economy and the stability of crucial marine ecosystems like coral reefs. Some countries have even established shark sanctuaries throughout the entirety of their waters. A shark sanctuary is a place where sharks can live and reproduce without the threat of fishing. Since many shark species are migratory, the establishment of small protected areas or breeding closures is not enough to protect sharks that may leave the boundary of safety. Shark sanctuaries present an opportunity to protect sharks over a larger scale before it is too late. The Pew Environment Group is the conservation arm of The Pew Charitable Trusts, a nongovernmental organization that works globally to establish pragmatic, science-based policies that protect our oceans, preserve our wildlands, and promote clean energy. For information, visit http://www.pewenvironment.org/. The Coral Reef Alliance (CORAL) unites communities to save coral reefs. CORAL provides education, tools, and inspiration to help local communities become passionate environmental stewards of the reefs. Together, we develop well-managed marine protected areas and sustainable businesses to benefit coral reefs and people. For more information, visit http://www.coral.org/. Registration is required for this event. Use the link below to register. Please RSVP by Friday, January 27, 2012. The Pew Charitable Trusts makes every effort to comply with federal, state and local government ethics rules when hosting events. Please make sure that your participation is consistent with applicable ethics rules.